A man went to the doctors and said ‘Doctor I keep singing The Green Green Grass of Home’ ‘Ah’ said the doctor, ‘You’re suffering from Tom Jones Syndrome but don’t worry Its not Unusual’. An old joke but there is precious little green green grass to see thanks to the drought. Fly life has however flourished but the high water temperatures have made the fish a bit torpid and frustratingly difficult to catch. 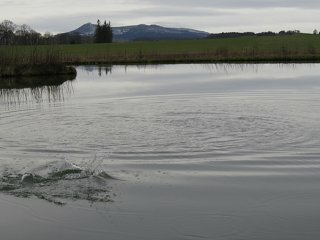 At Lochter Fishery, Oldmeldrum plenty of fish can be seen swimming lazily round ignoring perfectly presented flies. Into the middle of the week myriads of corn lice invaded the place and this certainly stirred the trout into action. On the Muckle Troot loch the fish were swimming along basking shark – style scooping the lice off the top of the water. The secret of success was to keep your flies in the first few inches of water using the washing line method, shuttlecock CDC buzzers or shipmans buzzers. Using these methods D Stanner had ten, K Lynch eleven, Mike Shewan fifteen, K McGregor twelve, Graham Rhind eight, Jim Addie seven and A Ross nine. At the time of writing there is a very gently rainfall, insufficient to help much but perhaps enough to cool the top water layers. The forecast is for more but nothing like what is required to fill the burns and rivers, swell the tatties and green up the grass.